In my last post, I wrote about in-person client meetings and some of the things you need to consider in order to have a successful local meeting. If you are exploring non-virtual business and looking to take more of your work offline, face-to-face networking is a great way to make connections and find new opportunities. We all know there are a lot of places online where you can network and expand your professional connections. There are a lot of places offline you can network as well, although it will take a little more research and exploration to find the best opportunities for you. You can also plan and organize your own event. It can be as simple as a one-on-one meeting with someone you’ve met online (be sure to follow the safety guidelines in my previous post). You can also join a group meeting through sites like MeetingWave and Meetup. Just like online networking, you should go into a live networking situation with a clear goal in mind. 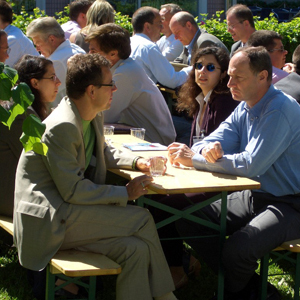 Are you interested in meeting like-minded colleagues? Are you looking for potential clients? Are you interested in meeting new people and generating new ideas? Why are you there? Take time to set goals for the event. By focusing on connecting with others and not making automatic sales, you will alleviate some of the pressure these events can hold and make yourself more approachable in the process. Be prepared with an elevator speech and ready to answer common questions about your business and what you do. You can even practice this ahead of time so you are relaxed and comfortable sharing the information. And don’t forget to bring business cards to hand out to everyone you meet. Here are some more tips to make your in-person networking experiences as successful as possible. Be willing to approach people and introduce yourself. Shake hands and make eye contact with everyone. Ask open-ended questions and be sure to listen to what others are saying. Avoid staying in one place for the duration of the event; mingle for the biggest impact. Follow up and follow through after the event. Do you network in person? What tips can you offer to others?